Home » Blog » Is Astigmatism your Fault? Any amount of reading that you do about a vision concern or complaint of symptoms can lead you to a great deal of confusion. Your vision is blurry, and that could mean that you have astigmatism. It could also mean that you have presbyopia. Both conditions are common, and both have been related to biological changes that occur with age. Also, both have been misinterpreted wildly, causing misperceptions in the causes and treatment options that can improve vision. 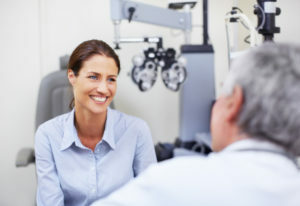 If you have any of the symptoms of astigmatism, such as frequent headaches or eye fatigue, blurred or distorted vision up-close and at a distance, or general eye discomfort that causes you to squint, the best thing you can do is schedule a comprehensive eye exam. By evaluating the shape of your cornea, we can confirm or rule out the presence of astigmatism. Astigmatism is an asymmetrical curve of the cornea. In the healthiest scenario, this structure would exhibit a rounded curve. Some believe that we are all born with a certain degree of asymmetry, that the cornea is not perfectly-shaped in very many people at all. Issues arise when the front and back ends of the cornea are more pointed than round. The more severe this shape, the more imbalanced the flow of light through the eye. The cause of distortion is the actual shape of your cornea. This is not something over which you have control. No amount of healthy eating or supplementation will alter the symmetry of your eyes’ shape. So, the idea that astigmatism could be caused by any particular lifestyle habit, or, conversely, prevented by such, has no merit. What can be done for astigmatism? There are multiple treatments that may be appropriate for astigmatism. When the curvature is slight, patients may choose to wear corrective lenses. The LASIK procedure may also be appropriate for reshaping the cornea, or Conductive Keratoplasty may be the most suitable approach. Roholt Vision Institute has been performing treatments for astigmatism for several years. We understand that every situation calls for a customized protocol to attain optimal results. Find out how we can help you enjoy better vision by scheduling an exam and consultation in our Canfield, Alliance, or N. Canton office.